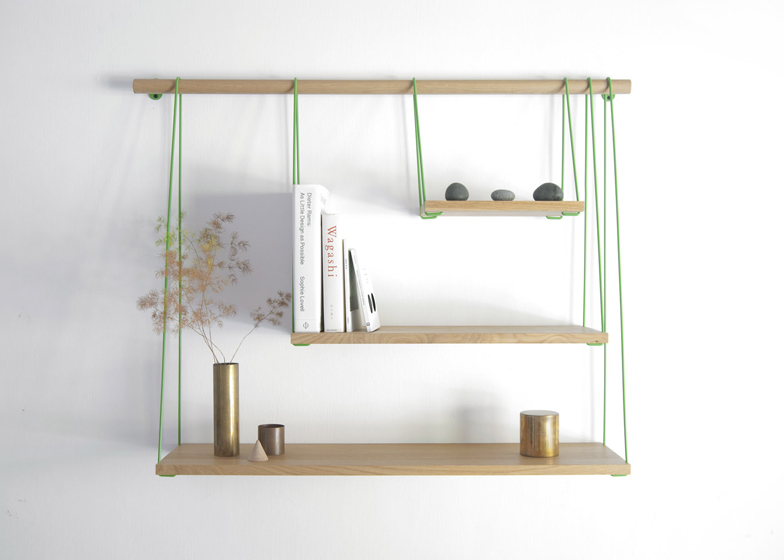 Product news: design collective Outofstock has created a shelving unit inspired by suspension bridges. Bridge shelves, designed by Barcelona- and Singapore-based Outofstock are produced by the Danish company Bolia. Firstly, a wooden baton is attached horizontally to the wall. From this, three solid oak shelves of different lengths are suspended using bent steel rods. The user can configure their own arrangement of the unit by moving the shelves along the baton. "We have always been fascinated by the beauty and engineering marvel of the Golden Gate Bridge and the Akashi Kaikyō Bridge" said the designers. "Strong and functional, at the same time awe-inspiring." Other projects by Outofstock include Hatched, a birds nest-inspired cafe and Vanity Shelf, a hanging storage box and mirror.